I have been wanting to do the tuxedo shirt onesie for awhile, and it could not have been easier! 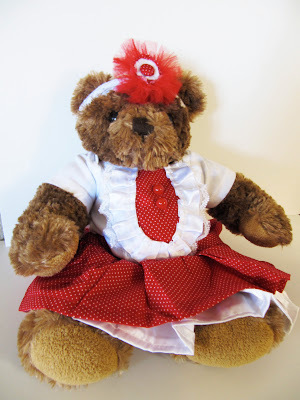 I fused some of the red polka-dot fabric onto the onesie and then sewed on some lacy ruffle stuff I found. 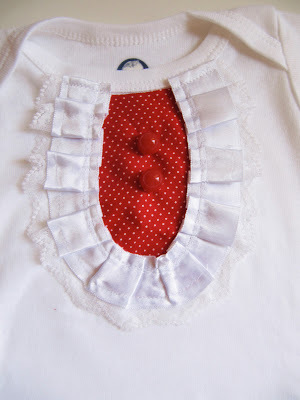 Add on a couple of red buttons and voila! I thought about doing the bum ruffles as well, but then I loved the red fabric so much that I made a full skirt with it and the white underneath is a shiny satin. Completed with another little tulle flower on a headband, I made everything you see (Except for the bear and the actual onesie) in a few hours! Sewing is so fun. This outfit is ADORABLE! Will you come to my house and teach me how to sew well? 🙂 I just had lots of baby showers…next time I'll keep your shop in mind.